Are you following the gluten-free trend? While we are not diagnosed with Celiac or any other serious digestive issues, my husband and I are doing an experiment by eliminating gluten from our diet. I have never been one to consume very much of it, but he did and has been experiencing some digestive and allergy issues. To try to restore health back into his life, we are going gluten-free for the next couple of weeks. Hence, the new gluten-free recipe!! These muffins are not too sweet, in fact my husband said they could use a bit more sugar. I, on the other hand, think they are fine just the way they are, so I will let you and your family make that judgement call. Combine the coconut flour, baking soda, and salt into a bowl. In a separate bow, beat together the eggs, agave, grape seed oil and lemon zest. Fold the dry ingredients into the wet ingredients and mix until well combined. Spoon batter into (6) lined cupcake tins. 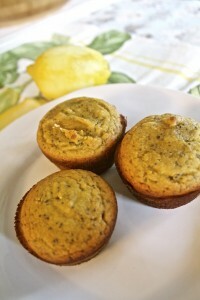 Let me know if you know of any other good gluten-free recipes, I would love to try them!